Fashion girls, wanna a shoulder bag? Wanna a handbag? Choose this rivet handbag. Optional strap that you can used it as a handbag or a shoulder bag. 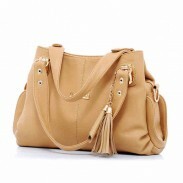 Features the rivet design that made the bag looks more fashion and cool. It is sturdy and spacious as well. I would recommend this to anyone. I really love this bag. Honestly did not expect this bag to be of such great quality. This exceeded my expectation.I can put everything in it.Great!! This bag has strong smell. But I like the design. It is a fashion bag with cool rivet. ByGoods Reply:Hello, generally the new will have a little smell because of the new material. Please take it out from the package and put it in well-ventilated place then the smell will go. Thank you.